Cross-contamination is a major concern for anyone working in a hospital or clinical setting. With the hectic pace in which healthcare facilities run, the unfortunate opportunities for cross-contamination to occur are many – even when numerous mandatory precautions are put into place. Aside from the dangers to the health and well-being of individual patients, cross-contamination can also lead to extremely high monetary losses to the hospital or healthcare facility in which the instances occur. Luckily, there are numerous measures that can be taken to avoid cross-contamination – one of which is the utilization of microfiber mops and towels. Here, we will examine some of the potential dangers of cross-contamination and how using microfiber can save both money and lives. Unfortunately, the mandatory sterilization procedures that accompany all actions within a hospital or healthcare facility are often taken for granted – and cross-contamination can easily occur if proper cleaning methods are not conducted. For example, the lumens and channels of an endoscope need to be cleaned thoroughly to remove debris that may be carrying pathogens. In this instance, using microfiber cloths for proper cleanup and sterilization is a genuine lifesaver. Unlike traditional cotton, microfiber can remove 99.4% of bacteria from smooth surfaces using nothing but water. This single benefit can greatly reduce the amount of chemicals needed to keep your facility clean, which also means that you will spend less money on any associated cleaning costs. The naturally anti-bacterial properties of microfiber make it the ideal material choice for both mops and towels – and the ideal material for sterilizing all surgical instruments. Instituting a professional laundering service for microfiber materials is incredibly cost-effective and takes the dangers of guesswork out cleaning those materials yourself. All hospitals and healthcare facilities have both hard and soft surfaces. Aside from desks and sinks, all waiting areas and – especially for visitor comfort – patients’ rooms usually include a couch or multiple chairs. Those soft surfaces such as cloth seat cushions, bed clothes, privacy curtains, cotton towels, and even carpet can harbor bacteria and viruses that can be easily transmitted to anyone who encounters the surface. If used to clean those areas, a microfiber mop can absorb up to 30% more liquid – and that same impressive statistic also applies to other microfiber products, such as towels. Thanks to the millions of tiny fibers that make up microfiber material, it is also incredibly absorbent, which means spills are mopped up efficiently and floors can be cleaned in a single pass, minimizing the risk of spreading germs and pathogens. 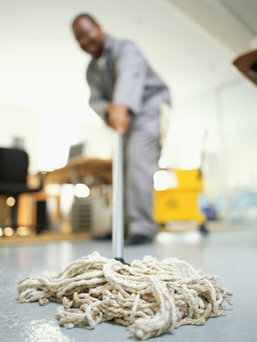 By renting your microfiber towels and mops, you can ensure that your facility will stay clean and sanitary. You can trust that a professional towel and mop rental service will understand how to clean your sanitation products so that they will be as good as new every single time you use them. For over forty years, Lord Baltimore has provided reliable, cost-effective microfiber towel and mop rentals as well as uniform rental solutions throughout Maryland, Washington DC, Northern Virginia, Southern Pennsylvania, and Delaware. We are an independently owned company that is confident in our ability to provide you with service above and beyond industry standards. To learn more about how microfiber can benefit your company and provide infection control, please contact Joe Bateman at Lord Baltimore by calling 800-292-1224. Microfiber materials can not only save money, but can save lives. This entry was posted on Friday, May 26th, 2017	at 1:22 pm	. You can follow any responses to this entry through the RSS 2.0	feed. Both comments and pings are currently closed.